Canvas bags don’t collect sweat, which may cause your punches to slip off the bag and hurt your wrist. 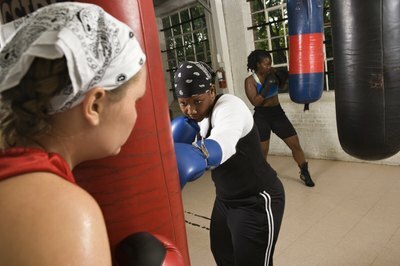 In a heavy bag workout, the power from your punches and kicks comes from your abdominal muscles. Because these muscles stabilize your body movement, you use the front of your stomach, or the rectus abdominus, and the sides of your torso, or the obliques. 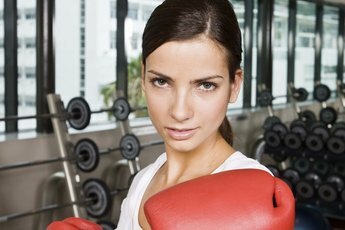 The rapid arm and leg motions against the heavy bag -- an object of resistance -- enables you to build bone density and lean muscle. Awareness of the connection between your abdominals and the movement of your fist is a critical component. To become aware of this connection, tense your abdominal muscles while sitting in a chair. Note the feeling of tightened abdominals and mimic it when you approach your bag and assume a fighter’s stance. Lunge toward the bag and strike it with the snap of a back-fisted punch. Do the strike again but tighten your abdominal muscles when your fist is about 4 inches away from the heavy bag. Exhale with force on the strike. Repeat this exercise, but vary your hand techniques. Punches and kicks engage your abdominals and work your lower body, providing a different workout than one using just your fists. Use combinations of the three strikes -- roundhouse kicks, hooks and uppercuts –- to give your abdominals an intensive workout. Throw either the front or rear hand for hooks and uppercuts. Focus on drawing the elbow back to your chest when you use an uppercut. 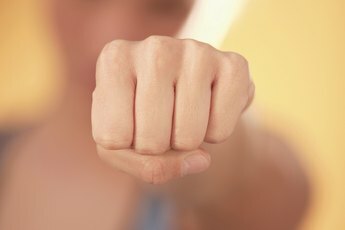 Drive the punch up to the bag and turn your fist so you see your palm. Begin with simple combinations such as: right uppercut and left hook; left uppercut and right hook; left and right uppercuts; left and right hooks; and random jabs and crosses. Get close to the heavy bag and use short punches, exhaling and tightening your abdominals on each strike. Add a roundhouse kick after throwing two hand punches so you achieve a 1-2-3 rhythm. Start with three 2-to-3 minute rounds, taking 30-to-60 second rests between rounds. Work your way up to 6 to 10 rounds as you grow stronger. Interval training increases the rigor and complexity of a heavy bag workout. If you use a timing device to track the interval, you keep better track of the sequence of moves. Maintain a distance of 2 1/2 feet away from the bag. Place your feet about a shoulder-length apart. Moving on the balls of your feet, bob and circle the bag. Target 70 to 80 strikes per round. According to David Zinczenko’s 2006 “The Abs Diet Get Fit Stay Fit Plan,” an example interval includes a warm up of three to fives minutes, followed by left jabs for two to three minutes. Then rest for a minute. Re-engage with right crosses for two to three minutes, followed by a one-minute rest. Begin a new interval with left jabs and right crosses for two to three minutes and rest again for a minute. Begin again with right and left hooks for two to three minutes, with one-minute rest. Close with random punches for two to three minutes and cool down for three to five minutes. Vary your arm movements by using chest throws. Stand about 12 inches from the bag. Squat low so your head and hands can reach the bottom of the bag. Similar to a football player going in for a low tackle, grab the bag and push it as hard as possible. Catch the bag on its return, absorb the impact and push it again. Aim to strike about three inches below the top of the bag. The forward and return paths of your punch should remain a straight line. When the bag swings back to you after a punch, don’t attempt a return punch by using ballistic motion. If you hit a swinging bag, you risk not only hurting your shoulder, arm and hand but also compromising your form by pushing the bag. Beginners should avoid heavy bags that weigh more than 75 pounds. 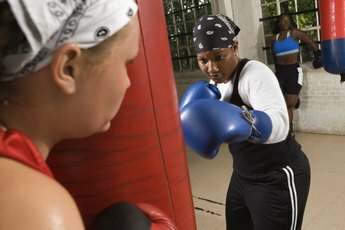 The immediate resistance of a bag that is too heavy can inhibit a beginner’s understanding of how to execute a punch, resulting in a push to the bag rather than a strike. Power Plyometrics: The Complete Program; Ed McNeely, et. al.